"On the 26th September 1975 at the National Arena, Kingston, Jamaica, King Tubby's sound system entertained the excited audience gathered there to listen to the almighty live sound of the Wailers on stage and the overpowering dub music that Tubby has made world famous. 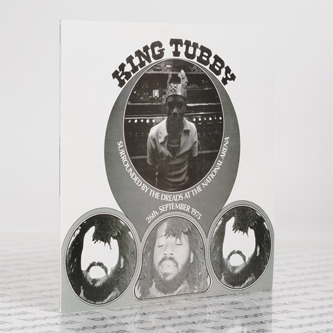 Before the concert, followers of other sound systems in Jamaica from Admiral Fate, Black Harmony, and Soul Attorney, were claiming that Tubby was no longer King. Tubbs had not been playing regularly andU. Roy, the live deejay king, had left him for Soul Attorney. "But on this particular night Tubby proved that he is still the King because he played from 6pm to 6am." So this L.P. is based upon some of the various tracks that King Tubby played at the National Arena that night. A few ofTubby's dubs appear on this new album as either naked and delightful as they were at the National Arena." The dreads hail the King. He continues to be the King of the dub Rock, at his Musical Chamber." Carl Gayle (Black Music).